A long established, friendly family business in Morecambe and Lancaster, Café Rastelli provides refreshment to Happy Mount Park visitors 7 days a week, all year round. 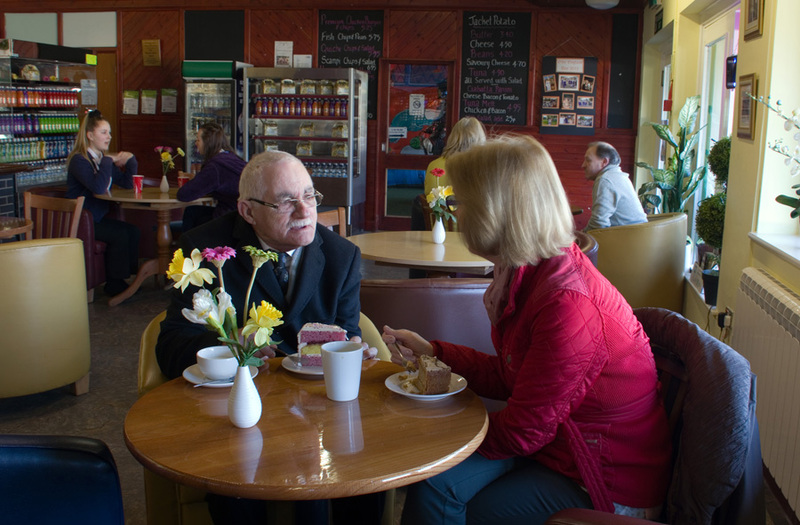 A relaxing place to meet friends for coffee and cake, or to bring the family for a light and nutritious meal, come enjoy the café at Morecambe’s favourite park! The café was restored in 2001 by Sheila and Paul Rastelli, and our Italian family heritage helps us to bring the quality home-cooked food, superb coffee, and good service of a traditional Italian café to Happy Mount Park. Visitors can enjoy their meals within the pleasant café atmosphere, or you might choose to enjoy the sun with an al fresco meal on our patio, which has outdoor seating for 100. Happy Mount Park is the setting for summer concerts and many outdoor activities, and all Café food can be packaged up in take-away containers so you can also enjoy picnics in the park! Our menu of nutritious family favourites includes salads, fish & chips, jacket potatoes and sandwiches, as well as sweet treats and specialty coffee, tea, and cold beverages. Our Children’s Menu offers smaller portions of the dishes kids love. Look out for our Special of the Day, which changes throughout the course of the day. Café Rastelli’s famous cake stand provides you with many tempting dessert choices with which to finish your meal, and a selection of pastries to enjoy with your coffee. We also sell the scrumptious flavours of our very own Lewis’s Ice Cream which you can enjoy in cones, ice cream floats, or accompanying a slice of cake! Using only natural ingredients including fresh full dairy cream, Lewis’s is authentic Italian ice cream made to a family recipe. During the summer months you can also buy ice cream, ice lollies, and cold beverages from our ice cream vans positioned throughout the park as the weather allows. The café at Happy Mount Park is a lovely place to meet friends for a stroll in the gardens and refreshments at the café. Our famous Rastelli coffee is brewed from beans roasted to our own original family recipe. Ghiradelli Hot Chocolate will delight visitors of all ages, especially during the cooler months of the year, and we also have a wide selection of teas and cold drinks available. Whether you’ve come to enjoy a round of Adventure Golf, a brass band recital in the gardens, or you’ve brought children to enjoy the soft play area, the café at Happy Mount Park provides quality food and drink at a central meeting point near the park entrance. There is pay parking adjacent to the park gates, local bus services stop nearby, Bare Lane Rail Station is a 10 minute walk away, and Happy Mount Park is located 1.5 miles from Morecambe town centre. The café at Happy Mount Park is open 7 days a week and we hope to see you soon!